SEMI-RETIRED carpenter John Leather spoke of his pride at being asked to make a special gift for the Pope for his historic visit to the UK. 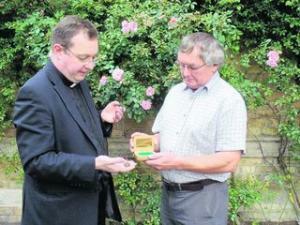 Mr Leather, 68, was asked by the Oxford Oratory to make a presentation box to hold a rosary that had once belonged to Oxford’s Cardinal Newman. It was handed to Pope Benedict XVI in Birmingham on Sunday as the Pontiff beatified the cardinal, who died in 1890. The gift was to mark Oxford's links with the great Victorian churchman, beatified in front of 50,000 pilgrims at Cofton Park, Birmingham. The cardinal is now likely to be made a saint. Mr Leather, of Wyndham Way, in North Oxford, has worshipped and carried out jobs at the Oxford Oratory of St Aloysius Gonzaga in Woodstock Road, Oxford, for 20 years. Mr Leather, who runs Leather Building Services, said: "I made it from a nice piece of English oak. "I'm semi-retired now. It was a tremendous honour to be asked to do it. My wife Mary made a green velvet pouch which it was placed in. "Father Jerome Bertram at the Oratory is quite artistic, so he was able to give me some drawings and exact measurements to work from. Sadly I was away on Sunday, so I was not able to see the presentation to the Pope." The rosary was presented to the Pope by Father Richard Duffield, a priest at the Oxford Oratory who was seconded to the Birmingham Oratory to help with the papal visit. Mr Leather's presentation carries a bronze plaque with an inscription saying the rosary had belonged to Newman and had been presented to the Pope. But the man who engraved it, Adrian Shepherd, said he had no idea who his work was for because the inscription was in Latin – and only found out its recipient from the Oxford Mail. He said: "That's fantastic. I was asked to engrave something in Latin, which I don't read very well. I had no idea that it was for the Pope. "I have engraved things that have been presented to some very famous people, such as Nelson Mandela and Mikhail Gorbachev, but never for a Pope." There are plans to build a chapel dedicated to Cardinal Newman at the Oxford Oratory, forming the centrepiece of a £5m development with a new library and cloistered courtyard.